There is an area called Thessalia, in the heart of Greece, in which one of the most well-known and best climbing areas of Greece is situated. 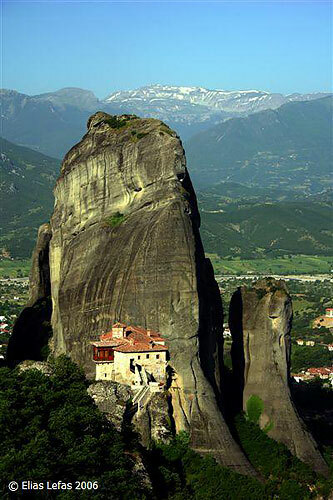 It is called Meteora, which translated means: the ones that stand, hang alone in the air. The first people who climbed these rocks were shepherds who carried their sheep up to the top to graze to ensure their survival. Moreover, there are indications that as early as the 9th century, monks had climbed to the top of the towers and monasteries were built. Monks withdrew there for solitude and spiritual communication with the divine. The place radiates a special atmosphere and that was the reason that the early inhabitants chose it, to express their ultimate communication and closeness to God. Now, let's go back to 1958 and to Germany, where a tobacco advertisement caught the eye of Diertich Hasse, a physicist and alpine climber. The advertisement used as a backdrop some magnificent rock towers. 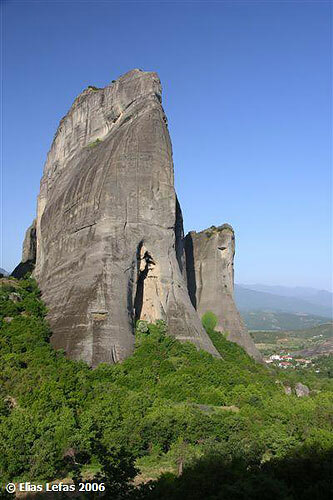 He was stunned and discovered that the area was in Greece, that it was called Meteora and that no form of climbing had ever taken place there. Despite this he constantly postponed his visit to Meteora (as at the time he was occupied in the Dolomites) to as late as 1975, when he visited Greece in collaboration with the photographer Heinz Lothaz Stutte and other German climbers. They immediately started climbing all the major peaks in the area with the exception of the five peaks on which the monasteries are located. The first routes to be climbed were the cracks and chimneys similar to those climbed in the area of Saxony in East Germany. As is the custom a small notebook was left in a metal box on the top of every peak. What is amazing is that on some infrequently climbed towers you can still find the notebooks dating back to the seventies and read the notes of the first climbers. On the first page the major routes of the pillar are denoted, as are the ways to descend (rappels) followed by the names of all those who have reached the top up to the present day. It is forbidden to climb to the towers on which Monasteries exist! There are no routes! This was what Dietrich Hasse and his team agreed together with the church authorities back in the 70's and this still applies today. By car: From Athens the distance is 357 km NW. You drive north following the signposts for Trikala then Kalambaka - Meteora. From Thessaloniki the distance is 258 km SW. The distance between Kalambaka and Kastraki is 2 Km. By Bus: From Athens get to the main bus station EL ATHENS at 260 Liosion str Athens (tel 210 8311434). A one way ticket costs 18,50 Euro. TOURIST INFORMATION OFFICE: 2431 0 25306 &amp; 2431 0 25343. 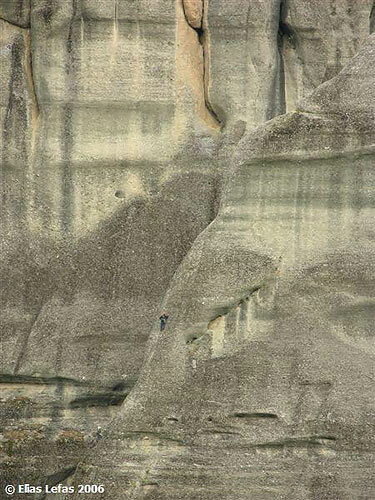 Climbing in Meteora never ends. There is an unlimited selection of routes. Get yourself familiar with the rock and the way of climbing it, after carefully studying &amp; consulting the climbing guides. Every route has its own beauty and worth. One of the classic routes is in the Holy Ghost «The pillar of Dreams » V+ 250 m. On the Sourloti rock «Hypotenuse» VI 225 meters and « The line of fallen drop» VI 170 meters. On Kelch tower «The eggs dance - Eiertanz» VI- A1 130 meters with the fantastic and breathtaking step across and in Alyssos the " Community Route" VI A2 320M. On the tower of Bell "Glockenspiel" VI 125m, in Bantova rock "Swiss cheese" VII - and in Doupiani rock " Ostkante VI 125 m. &amp; "Dickes Ende" VII- 145m. An amazing and well known corner (pictures 20,30,40) is in Holy Ghost «The corner of Madness » VII 180 meters and in the Caucasian tower a classic route "Roussanou End" V+ 160. If you prefer a little bit of everything (cracks, traverse, steep) go to The Tower of Meteora, at the "DOHLEWAND DIRECT" VI- 145 m route. There are a great number of hotel rooms and rooms to rent in the town of Kalambaka and Kastraki. Kastraki village is closer to the climbing areas and a well-known camping area among the climbers, is Vrahos (tel: 2432 022293/ 6 Euros per night). The place has complete facilities, toilets, restaurant and swimming pool. There you can also find the Hasse &amp; Stutte climbing guides. Other camping areas are Cave (tel: 2432 0 24802) and Meteora Garden (tel: 2432 0 22727). In terms of food, I have never heard a climber complaining about the food in Meteora. After climbing all day, the habit is to join with others, relax and drink beers. Around the area there are a number of restaurants and tavernas offering delicious Greek food. Plenty of fresh vegetables, fruits, delicious feta cheese and the well-known mousaka and souvlaki dishes. Do not forget to taste the delicious meat steaks, kontosouvli and the Greek kokoretsi made from animals bred in the area. If you find yourself there during the Greek Easter, don't forget that this is the major celebration of the Greek Orthodox Church. You can visit the Monasteries, but bear in mind that you have to be dressed decently to be admitted. Also, don't miss the celebration of Saint George, on the 23rd of April or the Monday after Easter. It is the religious celebration of Saint George the Scarf (Mantila). Perhaps you will notice some Scarves hanging 30-35m above the earth, on the pillar of Agio Pnevma, this is the church where the celebration takes place. The custom dates back hundreds of years. On the above date, young people climb and take down old scarves that have been hanging there for a year and replace them with new ones. The new scarves have been previously blessed with the wishes &amp; requests of the pilgrims. The old scarves are torn and divided among the people, who keep them as something symbolic to protect them and bring them luck during the coming year. If you find yourself climbing on towers close to monasteries, it is probable that you will become the tourist attraction to the monastery visitors, as they might congratulate and cheer you, when you find yourself on the top of the route! It has happened to many of us! The majority of climbers start visiting the area during Easter time. But this is not the only period! The ideal weather conditions of Greece (Mediterranean climate) permit climbing starting from the spring, late April to middle of June and after the hot Greek summer from September till the end of November. Generally speaking, climbing is possible throughout the whole year. In the summer, you can choose climbing routes, based on their orientation to the sun and shade. You can climb from 5:00 a.m. to 11:00 a.m. avoiding the heat, as the northern and western sides are in the shade and between 4:00 p.m. to 8:00 p.m. when the sun starts to set. The type of rock is unique and quite different from other climbing areas of Greece. The rock is mainly pebbles, stones, gravel and frail sandstone. Hundreds of big and small pebbles are all joined together in an integrated mass creating these pillars, which are as 300 meters high. The main routes are usually cleaned and steady, while one has to be careful to stay on course, to avoid non-stable stones and surprises! Bring with you a complete series of stoppers / nuts and hexentrics, friends as well as 10-14 quickdraws and a sufficient number of slings. It is best to climb with two half 50 m ropes. Do not forget your helmet! Before you choose a route, study the two climbing guides well, which provide detailed information about gear and physical strength required. The climbing guides provide analytical information in every pitch (material required- strength - difficulty, key of the route).